More than 10 million Ultraformer III treatments have been performed worldwide and now, with the addition of the Macro Focused 2.0mm (MF2) cartridge, the Ultraformer system delivers an even more comprehensive approach to skin tightening, lifting and rejuvenation with one device. The MF2 is specially developed to enable easier access to regions such as around the eyes, mouth, nasolabial folds and forehead. This allows practitioners to address wrinkles, tighten the skin and improve texture, tone and pore size even on the most sensitive areas. 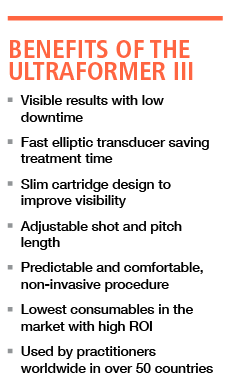 A slim, modern design, the MF2 cartridge provides substantial comfort and accuracy, while also giving the practitioner an increased level of visibility and precise coverage of treated areas. The MF2 also offers 20% faster shot and treatment speed, meaning quicker, more effective treatments. Ultraformer III is a high-speed, comfortable procedure that meets a clear need amongst patients seeking skin tightening without surgery. The minimally invasive treatment is both extremely customisable, clinically proven and an attractive clinical and commercial proposition for any practice. The Ultraformer III system has a patented ultrasound focusing and delivery method that precisely targets tissue at adjustable depths: Micro 4.5mm, 3mm and 1.5mm for tightening the face and arms; and Macro 6mm, 9mm and 13mm for micro contouring, with corresponding frequencies of 4MHz, 5.5MHz and 7MHz. Its innovative range of cartridges, including the new MF2 cartridge, allows for a completely versatile approach to treatment, whether it is lifting the face, chin, brows, eyes, neck or body, whilst also improving skin tone and texture and reducing the appearance of fine lines and wrinkles. Patients can go in for a “lunchtime treatment” and resume their normal routine afterwards. Patients can notice immediate results with progressive improvement up to 90 days post treatment. These results can be maintained for up to two years. Clinical evaluation supports this, showing a noticeable amount of skin lift at 90 days, with the patient experiencing low downtime or major recovery period. An additional benefit is that, due to its ease of use and dependable, non-laser technology, Ultraformer III can be delegated to suitably trained staff.